This is “Review Exercises and Sample Exam”, section 9.7 from the book Beginning Algebra (v. 1.0). For details on it (including licensing), click here. 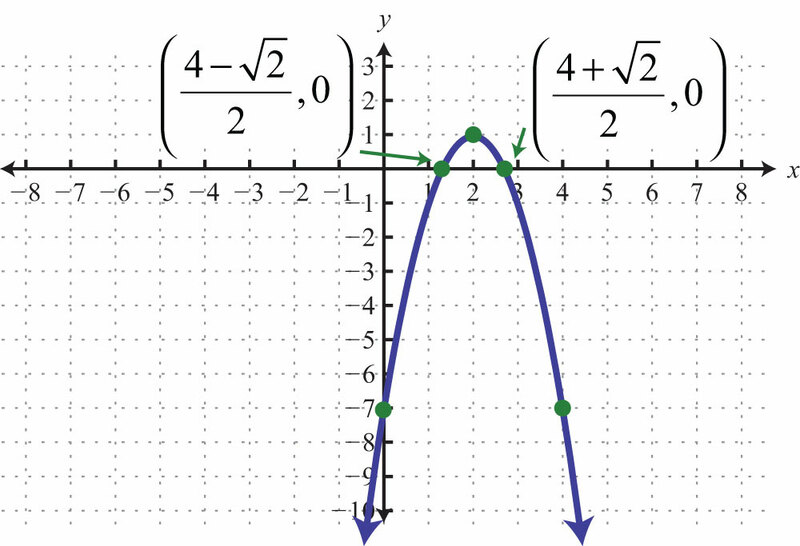 Find a quadratic equation in standard form with the given solutions. Identify the coefficients a, b, and c used in the quadratic formula. Do not solve. Use the quadratic formula to solve the following. Use the discriminant to determine the number and type of solutions. 63. The length of a rectangle is 2 inches less than twice the width. If the area measures 25 square inches, then find the dimensions of the rectangle. Round off to the nearest hundredth. 64. An 18-foot ladder leaning against a building reaches a height of 17 feet. How far is the base of the ladder from the wall? Round to the nearest tenth of a foot. 65. The value in dollars of a new car is modeled by the function V(t)=125t2−3,000t+22,000, where t represents the number of years since it was purchased. Determine the age of the car when its value is $22,000. 66. The height in feet reached by a baseball tossed upward at a speed of 48 feet/second from the ground is given by the function h(t)=−16t2+48t, where t represents time in seconds. At what time will the baseball reach a height of 16 feet? Determine the x- and y-intercepts. 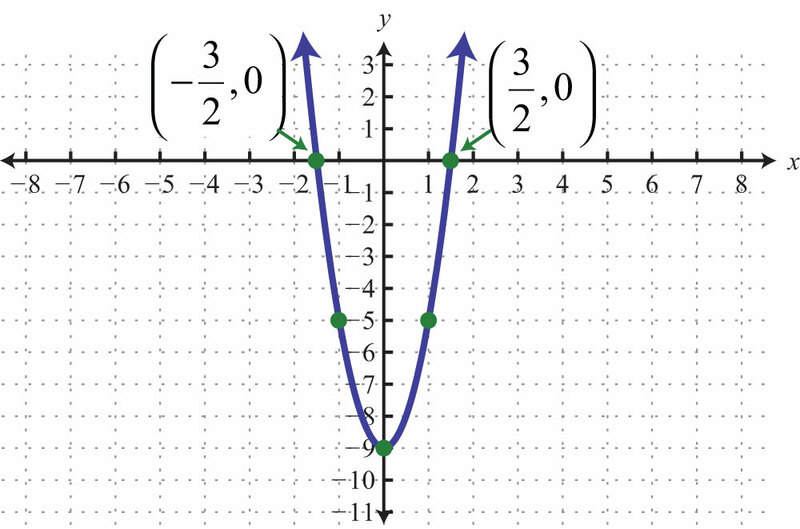 Find the vertex and the line of symmetry. Graph. 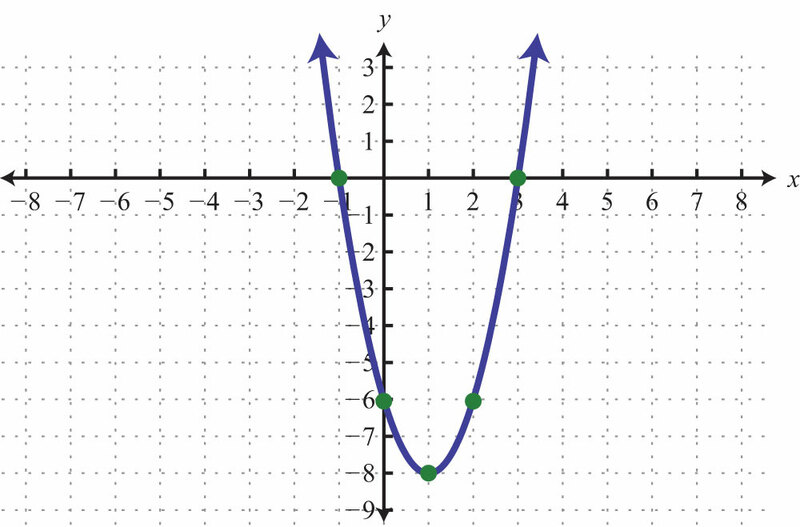 Find the vertex and the y-intercept. In addition, find the x-intercepts if they exist. Determine the maximum or minimum y-value. 87. The value in dollars of a new car is modeled by the function V(t)=125t2−3,000t+22,000, where t represents the number of years since it was purchased. Determine the age of the car when its value is at a minimum. 88. The height in feet reached by a baseball tossed upward at a speed of 48 feet/second from the ground is given by the function h(t)=−16t2+48t, where t represents time in seconds. What is the maximum height of the baseball? Set up an algebraic equation and solve. 11. The length of a rectangle is twice its width. If the diagonal measures 65 centimeters, then find the dimensions of the rectangle. 12. The height in feet reached by a model rocket launched from a platform is given by the function h(t)=−16t2+256t+3, where t represents time in seconds after launch. At what time will the rocket reach 451 feet? 17. 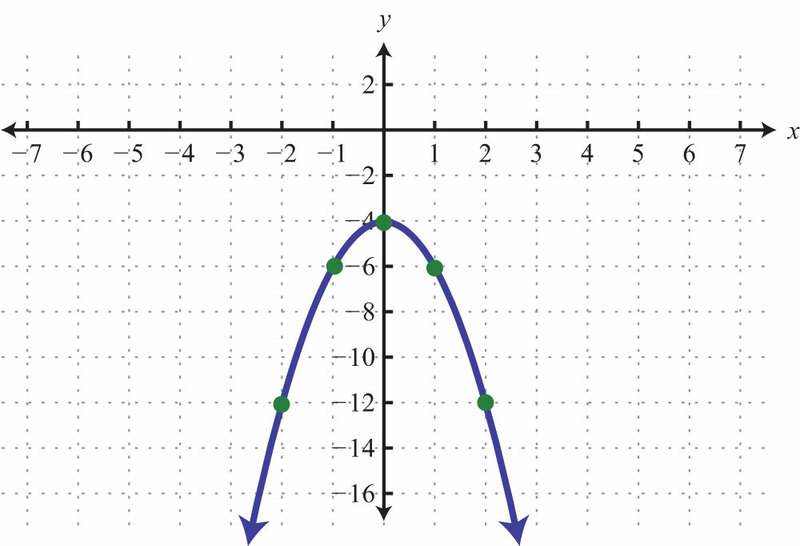 Determine the maximum or minimum y-value: y=−3x2+12x−15. 18. 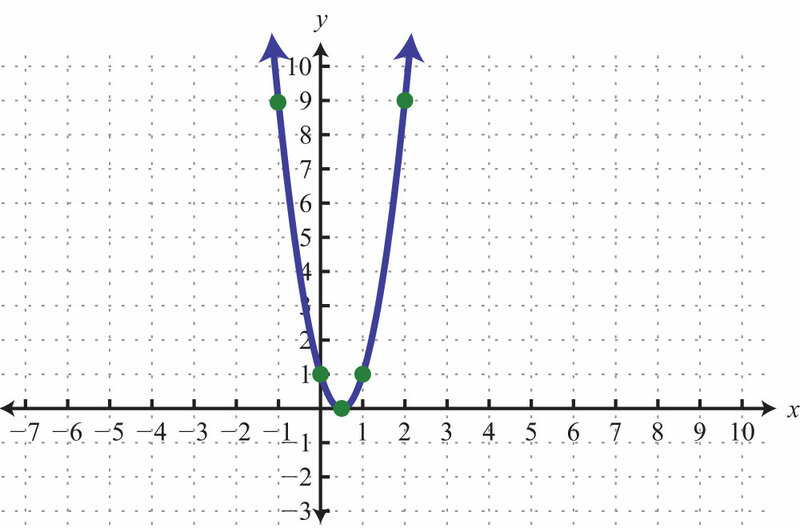 Determine the x- and y-intercepts: y=x2+x+4. 19. 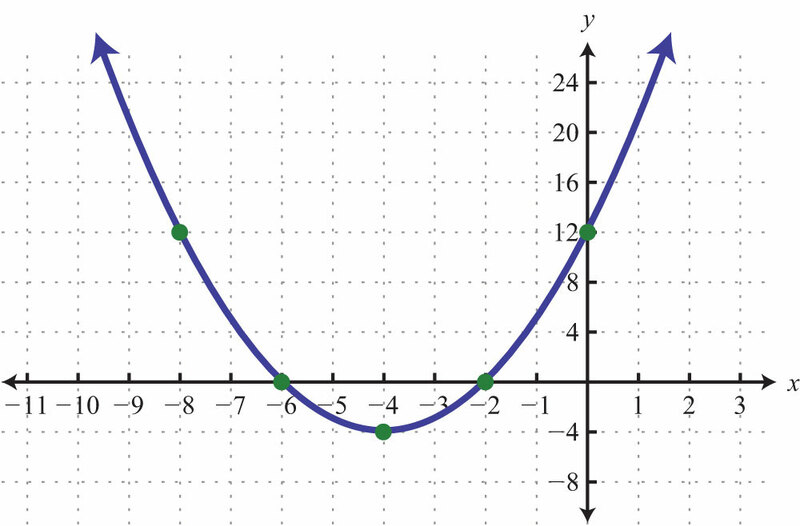 Determine the domain and range: y=25x2−10x+1. 20. The height in feet reached by a model rocket launched from a platform is given by the function h(t)=−16t2+256t+3, where t represents time in seconds after launch. What is the maximum height attained by the rocket. 21. A bicycle manufacturing company has determined that the weekly revenue in dollars can be modeled by the formula R=200n−n2, where n represents the number of bicycles produced and sold. How many bicycles does the company have to produce and sell in order to maximize revenue? 22. Rewrite in terms of i: −60. 65: It is worth $22,000 new and when it is 24 years old. 87: The car will have a minimum value 12 years after it is purchased. 21: To maximize revenue, the company needs to produce and sell 100 bicycles a week.